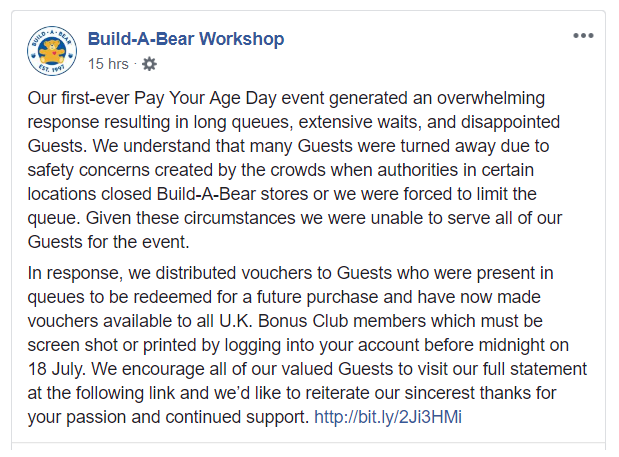 EDIT 13/07/18: Build-a-Bear are issuing vouchers to all Bonus Club Members who log into their account before 18th July 2018 as a response to yesterday's Pay Your Age Day event. Read their statement in full here*. "Per local authorities, our Meadowhall, Telford and Basingstoke locations will be closed for the remainder of the day due to extreme crowds and safety concerns. Please note: all stores in the U.K. are reporting similar crowds and lines, and they can no longer accept additional Guests for this event. The response to our Pay Your Age Day event has been overwhelming and unprecedented. We appreciate everyone’s patience and understanding at this time." 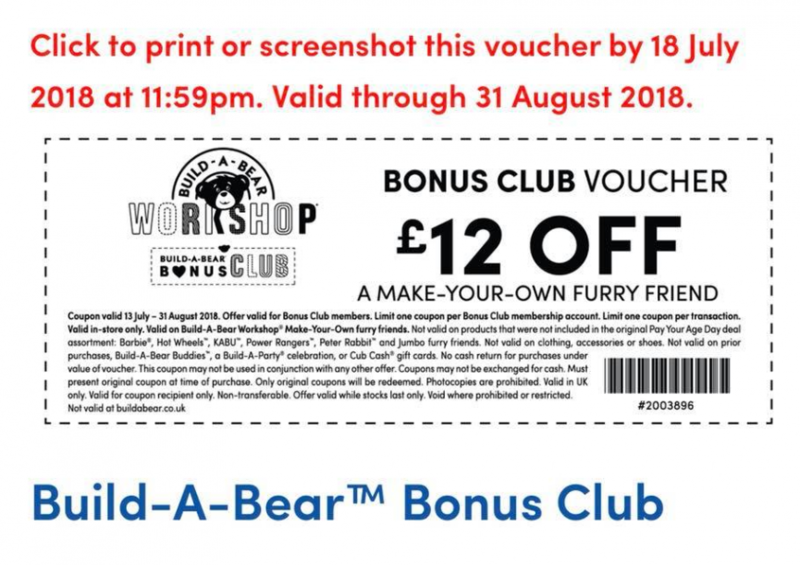 This offer is in store only, on Thursday 12th July, and is for Build-a-Bear Bonus Club Members only. The good news is if you're not already a member you can sign up for FREE now on the link above and take part in the offer. You just create an account and sign up for their free email newsletter, and you're in. So get signed up, if you're not already, and keep checking your emails! Children under 1 year will pay £1. sign up to the bonus club and you get your smallest ones their bears for £3 - it's only valid on Thursday tho!! Literally just looking at this!! I’m guessing it would be free or £1 for Matilda! Quite a few people are saying it’s the small ones for £3 but apparently they’re going to release details soon.. sounds good right! Does this apply to the outlet stores? It's a very good offer... And we're in Brum anyway that day for Sea Life. Oooh Amelia has been begging to go here!